This week’s secret ingredient for Friday Foodie Fix is balsamic vinegar. This dark delicious liquid can be used for savory and sweet dishes. Balsamic vinegar is made in and around the areas of Modena and Reggio Emilia and is produced from white Trebbiano grapes. Once cooked, the vinegar is aged for 3-5 years (young), 6-12 years (middle aged), 12 to over 100 years (noble). Did you know that Marcella Hazan has been credited with starting the balsamic vinegar craze in addition to introducing us to Italian cooking techniques? We have a lot to thank her for. I was lucky enough to meet her daughter in law Lael Hazan at BlogHer Food. We adopted her into our gluten free group and I hope I’ve kept my adoption into the Italian food world. 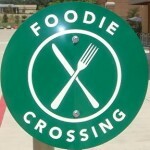 If you get a chance visit her blog, Educated Palate. There is a lot of great food there and a lot to be learned. If you need any help adapting anything to gluten free please let me know. How do you use balsamic vinegar? Most recently I’ve created dishes like Roasted Balsamic Chicken with Figs and Onions and Pesto Shrimp on Polenta Portobellos. Please share your recipes here via Mr. Linky. Next week’s secret ingredient is ……………Thyme! Hi Diane! Linked up my Pork Tenderloin w/Balsamic Reduction. Forgot to put my blog name, but oh well! Looking forward to some of the upcoming ingredients!! I linked my salmon recipe, but have to say that I also love to use balsamic vinegar to bring out flavors in fruits and vegetables. Hi Diane, hope I've linked properly. I made great GF dinner rolls today and topped them with goats cheese, raspberries, spring greens and balsamic vinegar. 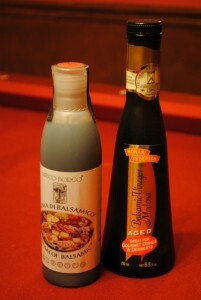 We love balsamic vinegar too! This is my favorite salad recipe. It was great getting to know Lael and adopting her into our little gf community. The non-gf folks who want to hang out with us at conferences have been so much fun and always add to my culinary knowledge and my perspective on the food blogging world. So glad we don't discriminate against gluten-eaters. I love balsamic vinegar – we have salad every night with dinner and we make a home made balsamic dressing, but instead of that recipe (because I just wing it every night, ha) I linked the balsamic beef recipe from my blog. Okay, so I double "entered" sorry. You can delete one. And of course being a newby I just inserted "Lexie @" HULLLO! Can't edit now. Can you fix for me? Thanks : ) This is fun, next time I will know how to do it right. Okay, so I triple "entered" sorry. You can delete the first two? And of course being a newby I just inserted "Lexie @" HULLLO! Can't edit now. Can you fix for me? Thanks : ) This is fun, next time I will know how to do it right. Good gracious! Now I can't even spell my own blog name right. I QUIT for the day!!! Thanks for the opportunity to share my recipe for Soy Free Teriyaki Style Marinade. It is a nice recipe who can't eat soy but love the flavor of Teriyaki sauce. My favorite brand of balsamic vinegar for special recipes (because it's expensive) is Elsa. The 6 year aged sells for about $17 and the 12 year is about $33. Now I only use it a little at a time!